Tomorrow's Culture and history painted today, onsite! 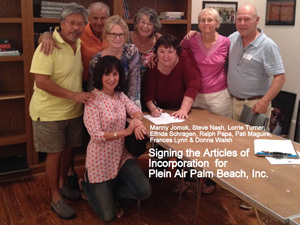 Plein Air Palm Beach vision is to work with plein air painters, local art groups, cultural centers and the public to support and enhance plein air painting education, events and exhibits. We welcome support and sponsorship from the cultural community to advance our mission & vision. PAPB is a 501c3 non-profit corporation. Palm Beach Plein Air Artists began with Donna Walsh organizing paint-outs for Palm Beach Watercolor Society (PBWS). At the same time Ralph Papa organized a Plein Air group to paint in and around Delray Beach FL. In the spring of 2013, Ralph and Donna decided to merge the groups. Later with help of key participants in the meetup group decided to use the Palm Beach Plein Air as the group name since this most aptly describes the area where we schedule paint-outs. PAPB schedules paintouts using meetup.com/palmbeachartists. PAPB is for art lovers and artists at all levels who love plein air painting in and around Palm Beach County and the surrounding South Florida vicinity bringing artists together to paint the land, sea and city scapes in beautiful south Florida. We paint and document today's landscapes that contribute to tomorrow's history. To get notices of where the paintouts are to be held, an artist simply needs to join our meetup.com group at Plein Air Palm Beach Meetup Group to receive notices of our planned paint-out meetups. Our mailing list is used only to notify members of our scheduled meetups, and notifications from group organizers. Palm Beach Plein Air Artists does not provide access to our mailing list to promote products or events. We have regularly scheduled paint-outs twice a month from October to May. At the end of the second paint-out we meet for a group critique and a picnic lunch. We also have spontaneous paint-outs throughout the year and work with community groups to have plein air artists at their events (e.g. Delray Affair, The Boynton Beach Art District events, 19th Annual 2013 Street Painting Festival, etc. Currently we are sponsored by Hands Office and Art Supply and Delray Beach Center for the Arts..
How does membership work in Plein Air Palm Beach Meetup group? 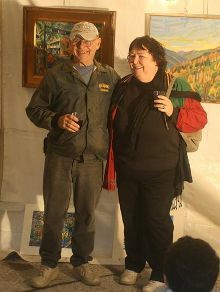 Membership in the meetup is open to all artists who have a sincere interest in plein air painting. We welcome resident artists and visiting artists at all levels to come out with us to paint Contributing artists in PAPB have other benefits. What are the benefits of being a contributing artist of PAPB? Contributing Artists are eligible to participate in PAPB shows and exhibits. Contributing Artists are listed on the PAPB website and are eligible for an enhanced artist portfolio listing (nominal set up and yearly maintenance fee). Extra donations at the Donation and Supporting Level are welcome from contributing artists who wish to make a donation to PAPB in addition to the exhibiting level. We promise we will make good use of the extra donation. How do I become (or renew) a contributing artist of PAPB? Contribution can be made by Pay Pal. Copyright (c) 2014 pleinairpalmbeach.com. All rights reserved.